A fire late Saturday morning left a Hyndsville family of four homeless. 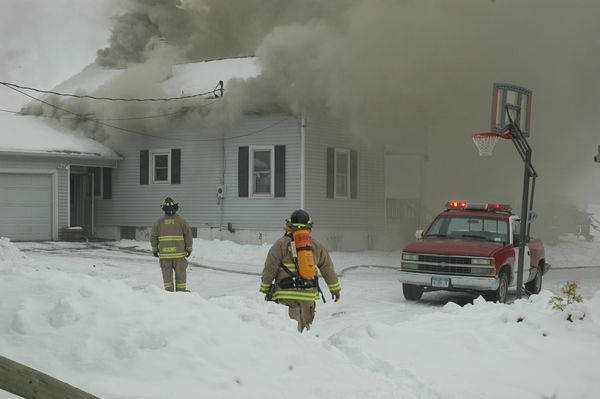 Fire officials described the Route 10 home of Duane and Gena Tillapaugh as a total loss after the intense, smoky blaze. The fire began about 10am in the back part of the house, apparently by a stove that may have been accidentally turned on while no one was home. But Schoharie County Fire Coordinator Matt Brisley said one of the family’s dogs may have tried to reach something on top of the glass-top stove and accidentally turned it on. Getting enough firefighters to the scene was a problem at first. Sharon Springs and Richmondville volunteers arrived shortly afterwards, and the Carlisle, Central Bridge and Summit departments were on standby. Nobody was injured in the fire, but the Tillapaughs lost one dog and three cats to the fire. One dog and a cat escaped. Mr. Tillapaugh is a deputy with the Schoharie County Sheriff’s Office; Ms. Tillapaugh is with the First New York Federal Credit Union in Cobleskill. Though the family has insurance, donations will help them through the initial recovery, Sheriff John Bates said. “A fund was essentially set up by friends to help them right away,” Sheriff Bates said. Checks can be made out to The Duane and Gena Tillapaugh Fire Fund and mailed to First New York Federal Credit Union, 795 East Main Street, Suite 1, Cobleskill. Anyone with questions can call the Credit Union at 234-2583.